The Mount Jefferson Wilderness is a wilderness area located on and around Mount Jefferson in the central Cascade Range of Oregon in the United States. It is situated where the Willamette, Deschutes, and Mount Hood National Forests meet. Mount Jefferson Wilderness is the second most visited Oregon wilderness area after the Three Sisters Wilderness. At 10,497 feet (3,199 m), Mount Jefferson is the second tallest mountain in Oregon. It is a stratovolcano with slopes mantled by five glaciers - Whitewater, Waldo, Milk Creek, Russell, and Jefferson Park. Three Fingered Jack is a heavily eroded and deeply glaciated shield volcano and consists mainly of basaltic andesite lava. At 7,841 feet (2,390 m), it is made up of the solidified lava plug flanked by ridges of the old volcano's subsidiary lava dikes and lies at the southern end of the Mount Jefferson Wilderness. Other geographic features of the wilderness include steep talus slopes, rock outcrops, and alpine meadows. Several lakes are situated within the wilderness area, including Marion Lake, Duffy Lake, Santiam Lake and Wasco Lake. Vegetation in Mount Jefferson Wilderness is predominantly Douglas-fir, Pacific silver fir, sub-alpine fir, mountain hemlock, lodgepole pine, ponderosa pine, several species of false cedars including, Alaska-cedar, incense cedar, and western redcedar as well as species such as vine maple, huckleberry and rhododendron. Lupine, red paintbrush, bear grass, and various species of lily are also common in the wilderness. Common wildlife found in Mount Jefferson Wilderness include deer, black bear, coyotes, and bald eagles. The Wilderness also includes Marion Lake, which is a breeding location for amphibians such as the rough-skinned newt. Common recreational activities in Mount Jefferson Wilderness include hiking, backpacking, camping, cross-country skiing, wildlife watching, and mountain climbing on Mount Jefferson and Three Fingered Jack. There are some 190 miles (310 km) of trails in the wilderness, including a 40-mile (64 km) stretch of the Pacific Crest Trail. Wikimedia Commons has media related to Mount Jefferson Wilderness. 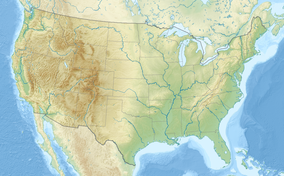 ^ U.S. National Wilderness Preservation System Map (Map). Wilderness.net. Retrieved 2014-07-28. ^ "Mount Jefferson Wilderness: Deschutes". U.S. Forest Service. Retrieved 2014-07-28. ^ a b c d Sullivan, William L. (2002). Thurman, Paula (ed.). Exploring Oregon's Wild Areas (3rd ed.). The Mountaineers Books. ^ "Cascade Range Volcanoes Summaries". USGS Cascades Volcano Observatory. Retrieved 2008-04-01.